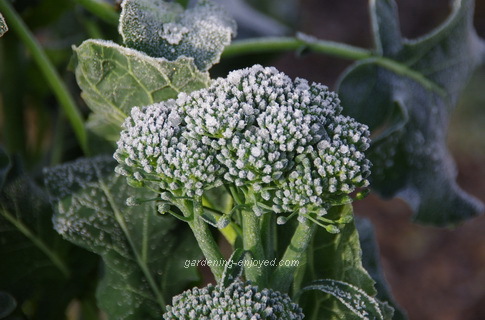 Dallying In The Dirt, Issue #241--- This morning's garden tour featured frozen Broccoli. The Assistant Gardener came upstairs this morning as I was about to leap out of my cosy bed and announced that it was -5 C (23F) and my leaping slowed noticeably. The hard freeze had finally arrived, albeit a few weeks late. The ponds had a skim of ice on them and a walk around the garden revealed some gorgeous, frost tinged pictures that will look much different when the afternoon sun applies its power. This lovely, frosted, head of Broccoli that has been enjoying the late warm weather will be tonight’s dinner. The plant will probably continue to develop for a few more days if the weather warms as it is supposed to. I actually planted all of my bulbs last week although I had to pull out a few, still flowering, annuals to do so. Now to do the dual job of emptying the water barrels while thoroughly watering the sites where the bulbs were planted. We can also eat more Brussel Sprouts. They get so much sweeter after they have been frosted. We have been watching them develop and only sampling a few while we waited for this freeze to sweeten them. Gardeners have a split personality, they enjoy the late warm weather and extended flowering but want the freezing weather to help some plants improve and to initiate the final cleanup of the garden. Apparently Mother Nature will not allow us to have both. The garage wall planters have been graced all summer with this new All America awarded Petunia, Tidal Wave Red Velour. It was cut back quite hard in late August. That’s much later than I normally recommend but sometimes my procrastination pays dividends. 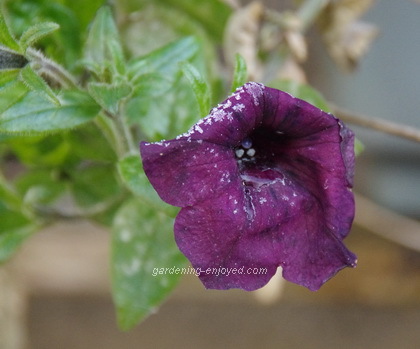 With the extended growing season this year these Petunias have almost become overgrown again. This frosted and frozen bloom is a delight this morning that will probably be mush by the time I return to it this afternoon. That starts the next set of chores. The garage wall planters will have to be taken down and have all of Petunias, and possibly a few weeds, removed. They will then be stacked for the winter at the back of the outdoor potting bench. The soil will not be removed. Next spring it will be loosened and have a bit of compost added and it will be ready to go for another year. New planting media in your containers is very good for the soil companies but in most cases totally unnecessary. The planters on the front porch grow wonderful flowers every year and they have been there for about 15 years filled with the original soil and the spring top up of soil or compost. That practice may give me the odd weed but removing weeds from containers is an easy task. I suppose I should feel sorry for my rabbit population. The cold weather has forced them to compromise their feeding preferences. These Turnips have been growing happily in the back garden for many weeks and they have been ignored by the rapacious rabbits. 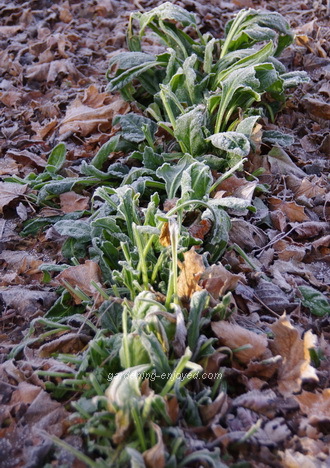 Suddenly, as most other green things have frozen and disappeared, the Turnips have been severely pruned. Maybe this is the opportunity to put my traps out again with some more delectable delights. I’m sure the rabbits would like to be transported to some other location to spend their winter. Inside the house there is a bright yellow Iris still blooming away. The bloom stalk showed up a couple of weeks ago and when the buds were showing significant colour, the weather man was promising a very cool night so I cut it and brought it inside. The primary buds are finishing and the secondaries are now blooming. A real November treat for this Iris addict. As that final Iris fades the bloom stalks on the Cymbidium Orchids have been rapidly elongating. It looks to be a very good winter for these long flowering delights. The early, bright yellow, ones should be open quite soon and the others will brighten the solarium during January and February. These wonderful winter blooms are my reward for watering and fertilizing these large pots of uninspiring green leaves all winter. Sandy Asks? I have a few fruit trees in my yard. The apple, pear, apricot and peach trees bear fruit that show signs of diseases. I hate to throw out the whole fruit so I clean it up and eat the parts that look edible. Is it harmful to eat? Ken Answers! You are still here to ask the question so maybe that's your answer :-) I do much the same with lots of produce from the garden. Cut out the soft brown bits and use the rest is my strategy. Colin Asks? I enjoy your comments and humor,and interesting blogs and tips.How do you get rid of that creepy crawling weed with blue flowers it is taking over my lawn.? Ken Answers! Not easily!! I have had limited success with a Boron spray. It's still taking over my lawn and then creeping into my beds. I'm contemplating killing the entire lawn area, (it's not that big,) next spring and then sodding or seeding. In our part of the world, most chemicals are banned and they didn't seem to work that well anyway.